Shipping Container Homes or, Cargo Container Homes, are built using shipping containers that have been designed and usually used to literally ship cargo from one site to another. They are built using steel and are made to withstand all of the elements a ship may encounter while transporting goods across large bodies of water. The standard size of a shipping container is 8 feet wide and 40 feet long, making it ideal for designing rooms without a great deal of structural modifications. Why Build a Container Home? They are durable and affordable. Repurposing these containers takes a lot of the guesswork out of how a building will come together. 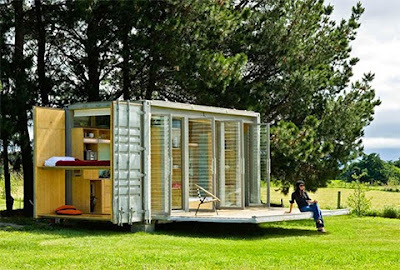 The modular design of a shipping container makes it an easy choice for building whether you want an emergency shelter, a guest house on your property, or want it to be your modern, ultra-hip primary living space. When built properly, they are as safe, if not safer, than the standard framed home or modular home. Their steel construction and reinforced frames are manufactured to withstand not only a trip across the ocean through unpredictable weather like ice storms and hurricanes, but they're also designed to be able to be stacked on top of one another. If you'd like to build a container home that's more than one level, by all means, go for it. You're also avoiding issues that come with wooden framed homes like water damage (and the associated mold) and termites. If there's a fire, you may lose what's inside of the steel structure, but it's unlikely you'll lose the structure itself. It should be noted that these containers are not designed to be completely buried underground. The weight of the earth will collapse the structure. Prepping the site by pouring a cement foundation and side walls and then retrofitting the container can prevent collapse, but it should be done only after an engineer has surveyed the property and reviewed your design. Generally speaking, shipping container homes are legal to build just about everywhere. They can be. Like any home, they can be solar powered and utilize nearly every energy-saving idea out there. Plus, building a home with shipping containers means you're reusing a product that's already served its original purpose and is simply being discarded or left to rot on someone's property. Homes built from shipping containers can be hot or cold like any other structure. If this is to be a year-round residence, you'll need to do some insulation work. Much of this depends on your design and how the home will be situated on your property. There are two fundamental ways to handle heating and cooling: passively and actively. Passive Versus Active Heat and Cooling of Container Homes? Active heating and cooling is usually necessary when the home completely accessible on all sides like a typical structure. How much energy the home will need largely depends on climate and any natural protection from trees, hillsides, etc.. Passive heater and cooling can be done efficiently by Berming. While it is definitely inadvisable to completely bury a container, Berming, where one side of the home is embedded into the land, is a strong possibility. The advantages are that it is easier to heat and cool than a free standing structure. Two distinct disadvantages are that if you want to relocate to another area, it's best to leave the structure and establish a fresh build on another site - essentially, you'd be starting over again, right from the land survey. The other disadvantage is that you'll need to ensure your design has two exits in case of fire or other need to evacuate. One way or another, setting the proper foundation for your home will go a long way towards saving energy and feeling comfortable in your home year 'round. How Many Shipping Containers Do I Need? Make a list of every room and amenity you'll need or want (don't forget kitchen space and a bathroom or two). Most containers are 8 feet wide and 40 feet long so it's easy enough to design inside using a grid model of 320 square feet. When reviewing your container home plans , don't forget that you'll need room for and wiring. After you decide on the size of the rooms, etc., multiply the square footage by 1.5. That gives you the total amount of room that includes circulation and space. Now take that total "dream home" square footage number and divide it by the square footage of each container (320). This will give you an estimate of the total number of 40' containers you'll need to purchase to get the job done. Example: A typical two-bedroom apartment is usually 850 - 900 square feet. Multiply 900 by 1.5 and you get 1350. Divide 1350 by 320 and you get approximately 4.2. Round up 4.2 and you're looking at purchasing 5 containers which is about 1066 actual square feet of living space. What Do Container Homes Cost? Shipping containers generally run from $1000 - $3,000 USD. So five containers would run you anywhere from $5,000 to $15,000. The wide variance is if the price includes transportation to the site, if it's new or an after-market sale, and if the container is already insulated. The rest of the overall cost would depend on the land, design, labor and any permits necessary. It's advisable to do a pre-inspection of the containers. There are many things that can be wrong with a shipping container so knowing what to look out for prior to purchasing them a can save you a lot of money.